Designing your dream backyard can be very challenging. The size of your space, layout of the land, local zoning regulations and a host of other issues need to be considered. At onelawn®, we have knowledge, experience and product to help deliver your dream. While we have numerous standard court kits for basketball, tennis and shuffleboard, we can easily create custom sized courts to fit almost any yard. All lines are painted onto the courts after the size specifications have been determined so there is tremendous flexibility on where they are placed. With 17 color options, we will design your court to fit your preferences and can even customize it with your favorite logo! 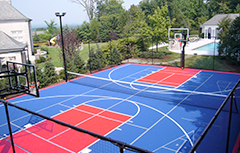 The best way to get the most out of your new court is to utilize it for more than one sport. If you have the room for a larger court, it is very easy to outfit it with additional lines and accessories so that you can play many sports or games. Standard line options include 4-square, badminton, hopscotch, basketball, tennis, pickleball, shuffleboard, volleyball and futsal. From installing the proper base to adding court lights, fencing and nets, onelawn® will install everything you need to create your dream court. Installation begins with a durable base. Our team can handle excavation of your land and install the asphalt or concrete that will ensure years of stability, endurance and optimal performance.